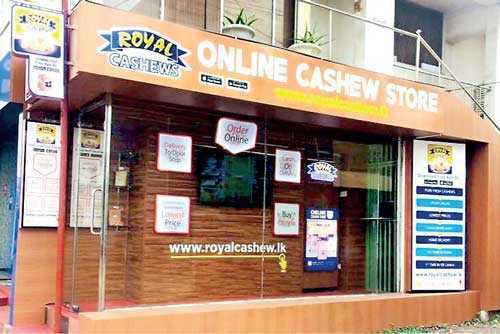 Royal Food Marketing Company, leading cashew processing company in Sri Lanka opens the first ever online cashew store in the country, ‘Royal Cashews Online Cashew Store’ at Nugegoda. Royal Food Marketing Managing Director Dr. Ruwan Wathugala graced the occasion. Consumers can order cashew from this online cashew store by downloading Royal Cashews software via Google Play or App Store and visiting the www.royalcashew.lk website. Over one kilogram of cashew can be ordered online and payment can be made online with VISA, MASTER or AMEX credit cards or on delivery of goods. Royal Food Marketing Company will deliver goods to any place in the country free-of-charge. With the opening of the online store, five cashew products namely; ‘Dehydrated Full Nut’, ‘Dehydrated Cashew splits’, ‘Dehydrated cashew pieces’, ‘Hot and Spicy cashews’ and ‘Salted Cashews’ can now be obtained online at certified lowest prices in the local market. Dr. Wathugala speaking of his newest venture said Royal Food Marketing is a company that benchmark with international standards to produce cashew products. “Consumers now prefer to order products online because of their busy schedules. Superior quality and mouth watering tastes are two major attributes cashew products sold via online should have. Customers have kept confidence on our cashew products. We decided to go online in order to offer our cashew products to customers dispersed all over the island,” he said. All these products are now available in Royal Cashews outlets situated at Crescat (Colombo 03), World Trade Centre, Liberty Plaza, Arcade (Independence Square), K-Zone (Ja Ela and Moratuwa), Kandy City Center (Kandy), Southern Highway (Welipenna stop), Negombo, Kiribathgoda, Nugegoda, Galle, Gampaha and Borella. Royal Food Marketing Company commissioned in 1999 has ISO 22000, HACCP and GMP standard certifications. It is the foremost cashew processing company in Sri Lanka conferred with ISO 22000. Royal Cashews products come in diverse mouth-watering tastes. These products are marketed with 19 tastes in 682 types of containers and in 101 containers specially made for gifting purposes. Research and development wing of the company has experimented and introduced cashews with tastes that are unique to the company. These tastes include; ‘Cheese and Onion’, ‘Sugar coated’, ‘Chilli Garlic’, ‘Hot Peppe’, ‘BBQ’, ‘Chilli Seasoning’, ‘Spanish Tomato’, ‘Salt Extra Fine’, ‘Shrimp & Red Onion’ and ‘Sour Cream & Onion’. In addition to this varieties, Sri Lankan authentic cashew curry canned and exported as ‘Royal Cashew Nut Curry’ by the company has created a heavy demand by foreign countries. The company sources and selects the best quality raw cashew nuts from Sri Lankan cashew cultivations for processing. Royal Cashews brand has won many awards, accolades and endorsed with standard certifications. The brand has won Pro Food 2009 and 2011 awards for nature–friendly packaging, MACO business excellence award, Lanka Star President’s Gold Award and ASIASTAR 2015 award for Green packaging.